The Troisième Symphonie in F sharp minor (1911) dates from the summer of 1911 when Vierne took vacation at the Dupré family villa in St Valery-en-Gau in Normandy. 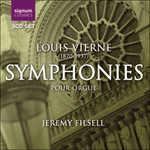 The Symphony is dedicated to Dupré who premiered the work at the Salle Gaveau in Paris in March 1912 (the impasse that concluded relations between the two men was still a few years away). Although here Vierne dispensed with overt cyclic considerations, his instinct led to subtle thematic relationships apparent between movements. The majestic Allegro Maestoso opens with an aggressive 'call to arms' and the jagged rhythmic edges heard at the start pervade the movement. A second subject is more lyrical in nature and the succeeding 'classical' development sees both ideas developed and combined. The dreamy and delicate Hautbois melody of the Cantilene meanders its way in long-breathed phrases of wide-ranging compass in outer sections and contrasts with a central homophonic episode. In the impish, scherzo-like and binary-style Intermezzo, the rhythmic outlines of the first movement's opening theme can be discerned whereas the Adagio is built upon a new, noble and tender melody (subjected to manifold transformations), revealing a Franckian or Wagnerian aesthetic debt. In the Finale, the first movement's jagged theme is smoothed-out to form a more graceful melodic shape and as in the Deuxième Symphonie, a minor key movement offers no glib triumphalism, working out its destiny with dramatic intent. The tonic major key is established at the very last and the conclusion hints at a more optimistic and positive note.